Facebook’s ad creation and posting system is one of its biggest moneymakers. It’s a way of building a community, not just sidebar ads to be ignored, and Facebook is continually adding new features and options to the process to make it more user-friendly. 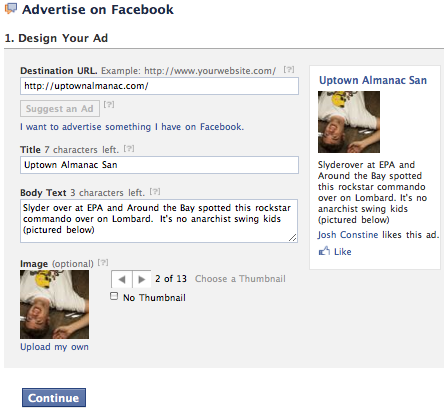 The latest, as reported by Inside Facebook: “Suggest an Ad,” a new feature in the Ads Manager tool. It’s a step towards automated ad creation and posting, and it seems very promising in that regard, if not entirely polished yet. Instead of manually entering all that tiresome data, like title, picture, and the body text of the ad itself, all you have to do now is enter the destination URL of the page in which the product resides. The ad then auto-populates, grabbing all that information from the destination URL, which can then of course be edited. The problem is, you might well need to edit it, which sort of defeats the whole purpose of the ads. It’s not a very precise auto-population tool: It clumsily chops off the title at the 25 character limit (resulting in awkward or unclear titles) and can only snag the first non-headline block of text for the body. So if you have an aside as a first paragraph, it’ll grab that instead of what you actually want in the body of the ad–and there’s no way to cycle through blocks of text. But Facebook will doubtless keep improving the system, and even as it stands, it’s a nice little trick for faster and easier ad production.